TheArthur Wright wanted to lighten the tusks on an elephant in a painting depicting Hannibal's descent on Rome. He was using a blue-ish paper and he wanted the tusks to be a proper white. He tried various chemicals like battery acid and fingernail polish remover. Somewhere in that timeframe an artist friend suggested he give bleach a try. Wright tried it, and a new painting technique was born. For the past five years, Wright, a painter who also worked as an electrician for 31 years, has experimented with bleach with remarkable results. "I get the best effect with black poster board paper," he explains, pointing to the first pieces he created with the new technique. "The Martyr Trilogy", portraits of Martin Luther King, Malcolm X and Medgar Evers. "And Clorox bleach is the best for this, it gives the strongest effect. With the different strengths, I get different shades." The method renders a surprising gold coloring that seems to glow. A painting in progress of an African female warrior illustrates the different tones. The skirt is reddish, knife of gold at her belt; the shield is a shining platinum white; the feathers in the headdress range in between. "I try for a three dimensional quality," Wright says. "I want the subject to step off the face of the paper, shake hands, do whatever and get back up on the painting. I want it to be that real." Toward that end, Wright also uses a more traditional painting technique - pointillism, the use of tiny points of color to create images. Wright favored pointillism before he discovered the bleach method, when he was working in charcoal and water colors and has sucessfully incorporated the new medium with the old style. I asked him why the technique fascinates him. "I saw a blow up of a photograph and it gave me such a visceral feeling, that particular image. It was so powerful. It was one of the most powerful presentations of an image I'd seen and it looked doable with practice and attention to detail," he said. 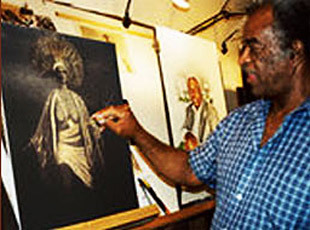 His subjects are taken primarily from African culture and African-American history, including portraits of Frederick Douglass, towering figures like Paul Robeson, Ron Dellums, Josephine Baker, Tina Turner, Sojourner Truth and Harriet Tubman. He often composes the face based on several pictures or portraits, capturing an expression that won't be found in any other portrait, nor anywhere else on earth. Indeed Tubman's face has an ethereal quality that uniquely expresses her role leading slaves to freedom on the Underground Railroad. Wright is particularly fond of the "Tyger" series. Wright was inspired by the William Blake poem that begins with the line, "Tyger Tyger burning bright, In the forests of the night”, and he continues the old english spelling of the name in the picture titles.The first Tyger is a silhouette barely distinguishable from the black background with yellow baleful eyes; Tyger #2 is more yellow; Tyger #3 is a whiter yellow and Tyger #4 is almost lost in yellow flames with his eyes and nose black. "I usually have a story behind the work. The images are driven by the thought of what I wanted to portray." The story of his painting career is itself unusual. He was an electrician who began to paint. After he had been working on developing a style and technique, a vision, his wife told him he was ready to show his work; he didn't agree. One day she presented him with checks obtained from the sale of his work. After painting for some years, however, he took a 20 year hiatus. He started painting again in 1994 when his goddaughter got married and informed him she didn't have any art for her walls, for god’s sake!. "I did it and afterwards felt that stirring again so l thought I'd try to keep it going, I wanted to continue to feel that special thing, a rarely experienced state." He continues to experiment; a painting in progress of African singer Miriam Makeba combines the bleach method with bright red water color. "I am very excited about the potential and the possibilities." Wright's work will be on display today and next weekend in the Open Studios program at his studio, 527 23rd Avenue, Oakland. Brenda Payton writes far ANG newspapers.